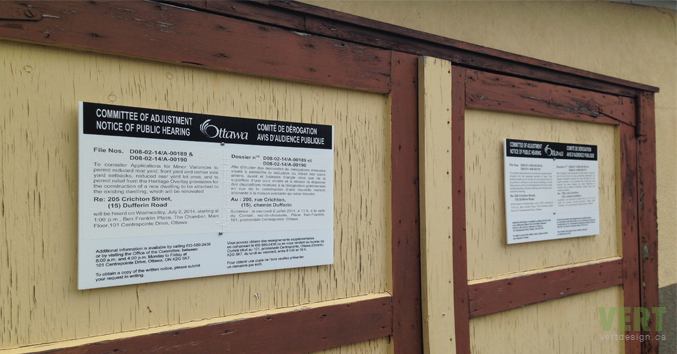 The applications to the Committee of Adjustment for minor variances from the zoning bylaw and for consent to sever the property were made on June 9. A letter acknowledging receipt of the applications was received on June 10. Notice of the public hearing to be held on July 2 was circulated to all neighbouring property owners and the community association. Signs were also posted on the property (in adherence with specific instructions) to notify the public of the hearing. At 1:oo pm, on July 2, 2014 the applications will be considered by the Committee of Adjustment.